Day 2 of Armchair Book Expo. Yesterday, we did introductions and discussed best practices in book blogging. Today, we are taking a look at what readers look for in a great book and collaborating and listening in today's book blogging world. I want to re-read the book again and again. These books usually have characters that I can relate to, who become like real people to me over the course of the story. The plot is typically multi-layered and with each re-read I discover something new or uncover a forgotten gem that makes the story even richer the second (or third, or fourth...) time. I'm blown away at the end of the story. You know that feeling when you've read the last word and all you can think is "wow"! Those stories that make you pause before diving into a new read. A Tale of Two Cities by Charles Dickens was a book I read over and over again throughout high school and college. It has been a number of years since I've read it though. Harry Potter was probably the next series that I re-read a bunch of times. There was so much going on in the books, particularly the later ones that I always find something new. And I loved the characters so it was like going back for a reunion. 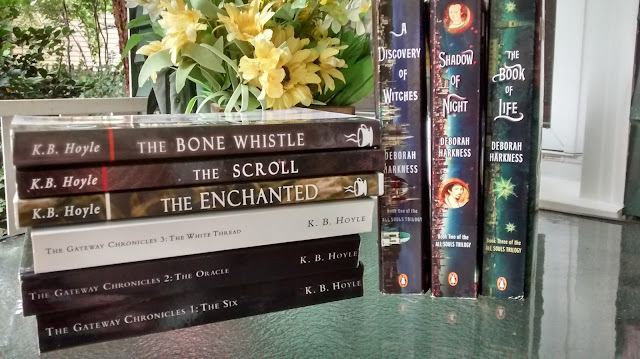 The Gateway Chronicles by K. B. Hoyle is a recent series that I found I enjoy re-reading. I re-read it last year and was just as entertained as I was the first time, but now I was trying to spot the clues that I knew I missed the first time through. It was really fun and just thinking about the series makes me want to read it again. All Souls Trilogy by Deborah Harkness is another series that I don't get tired of reading. There is so much detail packed into the pages that it is impossible to take everything in the first time around. Often books that fall into the second category are books that aren't really meant to be re-read because you know it won't be the same the second time around because you know how it ends. These books are often mysteries and thrillers. But they are still great reads, Books that make it hard to pick up the next book in the pile because you are convinced that nothing could be as good as this one. Lilac Girls by Martha Hall Kelly. I loved how the stories and lives of the three main characters intertwined. The writing was excellent and the characters, who are real people, and the story line is well researched. Never Let You Go by Chevy Stevens (I think all of Chevy Stevens's novels have left me a little stunned at the end). She pulls the reader into the story and does let you go until after the last page. Accused by Lisa Scottoline was a really great mystery that kept me guessing to the end. An Acre of Fools by Aden James was one of those books that I wasn't really sure why I was reading it until I got to the end and then I was so glad I did. I love writing like that. Where you are unsure of the story and the characters, but then everything is brought together and it is brilliant. Then there are a couple of recent books that I think fall into both categories. I haven't re-read them yet because I didn't finish them all that long ago. But I think I should. A Bandit's Tale by Deborah Hopinkson is another well-researched novel, but this one is for middle school age kids. The narrator is a bit unreliable but I actually think the reader is the only one he is truthful with. I loved the characters and there was a lot of details to take in. The Women in the Castle by Jessica Shattuck - there is a lot going on in this novel with varying time points and points of view that I'm sure I missed details. When I finished it I wanted to immediately start reading it again. I keep thinking about the book. I remember when I first started out blogging that there was a lot of interactions with other bloggers, readers, and authors. But over the years, I have had fewer and fewer interactions. Have we all gotten too bust? Is there just so much noise out there that I'm missing these interactions? Or are we all introverts who poked their heads out for a bit and now are seeking solitude once again? I think the answer to all of those question is to some extent YES. Since becoming the manager of publicity and development at work, I know I've been busier. Plus I had an injury that took a long time to heal and the pain and discomfort wore me out. Getting up the daily post sometimes took more energy than I had at the end of the day. I think this is true of others. Many of the people I talked with regularly when I was first started out are no longer blogging as life circumstances changed. My main place of interaction with bloggers was Twitter, but the sheer volume of tweets has made it almost impossible for me to have a conversation there anymore. It just all gets lost. I did a Twitter chat a few months ago and I forgot how much fun they are. I use to regularly participate in tweet chats, but either they have disappeared or not at a convenient time. Probably most bibliophiles are introverts to some extent and perhaps we have had our fill of interacting and need some time to recharge our batteries. Events: I think participating in blogging events is an important way to keep up with what is going on in the blogging world. I need to pay more attention to when Bloggiesta happens as I've missed it the last several times. Armchair Book Expo is a great way to check in each other. Starting last year, we have participated in the A to Z blogging challenge in April. It isn't just book bloggers and I like getting to see how others with different interest approach blogging. Groups: I belong to a couple of author groups on Facebook so I still keep in touch with that segment of the book community, but again I don't interact as often as I once did. Bookstores: I have been to the bookstore more often and a couple of weeks ago I had a wonderful conversation with a retired couple while browsing the bargain books. We found that we both enjoyed Karin Slaughter and then we exchanged the names of some of our favorite authors. We sort of held up the checkout line as we continued to remember other authors to recommend (thankfully we were the only ones in line). Last summer my local Barnes & Noble offered a number of book events that I attended with my niece and nephew. Blog Team: I mentioned yesterday that Girl Who Reads is compromised of a writing team of 3 reviewers, 4 features writers and me. I like the collaboration we have here. It made the A to Z Challenge easier to manage as well as blogging in general. I would like to collaborate a bit more on curated lists of reading recommendations, But overall I'm thrilled with how we work together. Charity: At the end of last year, I hosted a book/fund drive through my site for a local literary charity Books for Keeps. More than 90% of the students in my local school system eat free or reduced lunches which mean more than 90% of families in my county are living in poverty. 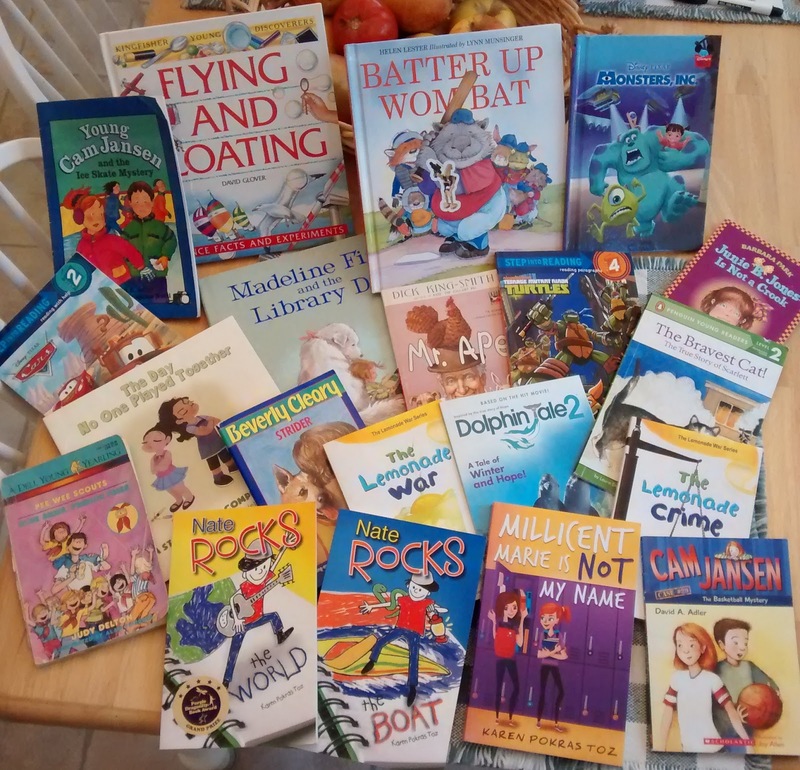 Books for Keeps makes sure every elementary school student has 12 books to take home at the end of the school year. Research has shown that reading during the summer increases retention of knowledge from the school year. They are expanding their efforts to more communities. If you would like to make a donation, please select the Girl Who Reads fund drive in the designation field. Okay, I think I've rambled enough. This topic was a little difficult to wrap my mind around and find what I really wanted to say. I guess it isn't something I've really thought much about. It's the last day to enter the March Mystery Box Giveaway. I am the same with my five star ratings! I always save that for books I know I will read over and over again. Great post - you seem to be both busy but staying on top of the collaborations :) I love that you included books that fill your wants - great list! If I want reread a book, it's probably going to end up a favorite. That being said there are some powerful books that I'm not necessarily eager to reread because they were so emotional and it took its toll the first time. I might reread these books someday, but only when I'm emotionally prepared. Great post! For me, one of the big killers of the old way we used to communicate and collaborate was when Google killed its blog reader. Now I am relying on Twitter to catch posts from blogs I follow but it's not the same. I really love this post! Love that you listed a charity in it! Ditto about the "wow" factor at the end of books. That is the BEST kind of read. Ugh totally agree it is hard to have a conversation on Twitter. I can't move that fast to keep up. In person events are best, but not always possible. Totally agree with you about 5 star reviews, as I think those should be saved for really special books! And yes, I think that most book bloggers are introverts so that has something to do with interacting with others. And of course, life happens and we all get busy. But it's fun to get together during events like the Armchair Book Expo!